lioconvoy wrote: e to say that number 1 is without a dout spectacular. it embodies everything aboout transformers in an epic, thrilling, mindbogglingly spectacular way what captures your interest and leads perfectly in to the episodes. Yeah. Just goes to show how the quality of a theme song doesn't always reflect the quality of its series (which also applies to several other theme songs in this list). Though, in all honesty Wing Saber, if I hadn't put the two Micron Densetsu songs so high up, would you have commented here? And now for the ones that didn’t make the list. As I’ve stated before (in the gag number 1 entry), for the Beast Wars Returns dub of Beast Machines, they reused the same opening theme song that the English version uses. And I’ve already covered how the narration in the opening differs from episode to episode, and that this goofy one just so happens to come from episode 14. And that the visuals in the opening are not the same as those seen in the U.S. opening. We first see Optimus Primal’s initial interfacing with the Oracle, cut to a silhouetted Megatron transforming. Optimus glares up at him and then all the Maximals are outside looking up. An army of Tank Drones moves forward with their master looming in the background overhead. Cheetor looks up enraged as three Cycle Drones transform. Beast Mode Megatron appears, as we immediately cut to three Maximals being chased by Cycle Drones (this happens a lot ), and then to Optimus pointing his finger. Noble looks up with the moon behind him, Megs commands a massive fleet of Aero Drones, Botanica arises, Nightscream is chased by an Aero Drone, and Blackarachnia lands on the ground. Tank Drones and Rattrap transform, pre-reformatted Nightscream points, Silverbolt jumps down and poses, Primal leaps down and transforms, Savage breathes fire, and the title screen, the only new piece of footage here, finally appears on screen to close the opening. Two reasons. One is that, despite the visual differences of this opening compared to the American one, there’s not really any coherence to them. Having gone and watched this opening muted while playing the non-vocal U.S. opening music in the background, the images in this opening don’t really flow together. There’s too many that seem to only show up just for the sake of showing up. Lots of these images are only on screen for a split-second and just feel like they were crammed in there. There are barely any scenes that last longer than one second, much less even reach the duration of a whole second. Two is that the song in this really cannot count because the simple fact that it’s not a Japanese opening theme song. The song itself is no different from its American counterpart whatsoever. I cannot put it on a list of Japanese songs as it is not a Japanese song. It’d be like putting Pikachu on a list of one’s favorite Digimon or something. They could have created their own original Japanese song for this opening. They didn’t. They could have added their own original lyrics to this song. They didn’t (the narrations do not count). They could have made any change to this song to try to make it make Japanese-authentic. But they didn’t. Therefore, it technically cannot count as a real Japanese song. Coupled with the imagery, it still counts as a Japanese TF opening, but not as a Japanese TF song. Let me first point out that I am sorry to say that I could not find a video of this opening. I was able to listen to it because I own an mp3 of it. This was the opening for when the Beast Wars episode "Bad Spark" was shown in theaters as a part of the Beast Wars Special triple-feature movie. Because I cannot locate a video of this song, I can only talk about the song portion. The beginning starts off with some great drumming and a lot of energy. Like the song in entry #3, the chorus precedes the verses of the song. Unlike that song, however, this chorus doesn’t sound all that stimulating. It’s kinda relaxing and a little funny, but it doesn’t really have that feel of excitement. Before switching to the main verse, the chorus ends with a funky cry of “Ii zo! Ii zo! Convoy!” Um… okay. Again, it’s because of a lack of visuals for me give it a fair judgement. The only imagery of this opening that I can track down is this image, which doesn’t tell me much other than it contains this scene from episode 27 of Beast Wars. Going by the song alone does not work out, as the song itself is kinda… weird. I mean, sure, "WAR WAR! STOP IT!!" was an oddball of a song, but that one had a bit of fun and humor to it. This, on the other hand… doesn’t. It’s probably the most bland-sounding of the Japanese themes and doesn’t really convey any real sense of emotion or enjoyment. There is energy to this song, but it’s not exactly put to good use, as it loses it in the beginning and has to work its way back up to that same feeling again, only reaching again it near the end. And the awkward cry of “Ii zo! Ii zo! Convoy!” sounds more like some random high school cheerleading cheer than a battle cry. While sometimes silly can be good, there are some things that are considered just “too silly”. 21. "Ano Yume no Kanata e"
Note: that this is beginning of the actual episode/movie, and so thus will continue to play even after the song on concluded. Press Pause once the song finishes so you aren’t stuck watching more than the intended song. For those of you unaware, the Japanese treated episode 43, “Cutting Edge,” as a special movie (like how they did for the above-mentioned "Bad Spark" episode), instead of an actual episode, and so gave it a theatrical release along with two other short films as a triple-feature movie. Thus, it’s the only episode to have not received a Japanese DVD release (only VHS). This song was featured as its opening and, unlike every other Japanese opening, played the entire song all the way through to a whopping length of 3 mintues and 20 seconds! The song itself is lively, upbeat, and fast-paced, but that’s about all that can be said about it. There’s not much else that’s all that special about this song other than its duration. It’s just a fun song with nothing else really going for it. As for the visuals, oh BOY is there a lot of them! Rattrap starts off speaking to us. Optimus speaks to us too with the other Maximals appearing behind him. Megatron speaks while standing in the sunset with the other Preds. The Maximals race forward as seen in the “Code of Hero” episode, all while there’s more speaking going on (let me just say that there’s speaking going on everywhere in this song, so I don’t have to always point it out). Optimus is stuck in his stasis pod as it flies up to the Planet Buster, which is promptly destroyed. The Quantum Surge approaches and then proceeds to turn Rattrap, Cheetor, the dying Terrorsaur, and Megatron into Transmetals. TM Megs roars and TM Cheetor unfolds his jets. We cut to a zoom in on Earth, which leads to the valley of the Protohumans. Megatron jumps down and then appears sitting on his throne inside the Metal Hunter. He laughs, transforms, transforms again, and flies away. Taratulas speaks to us. Waspinator flies in, transforms, and shoots us. Inferno transforms. Quickstrike transforms. Rampage transforms. Optimus transforms. Rattrap transforms and races off. Cheetor transforms and then flies. Rhinox doesn’t transform, opting instead to type on a control board. Silverbolt transforms. Depth Charge transforms. And Blackarachnia transforms, ending this mindless redundancy! Optimal Optimus speaks. Rattrap gasps. Op Op looks at us some more and then Megatron stands within the timestorm from “The Agenda, Part III”. Optimus Prime lies dead with his head slagged. 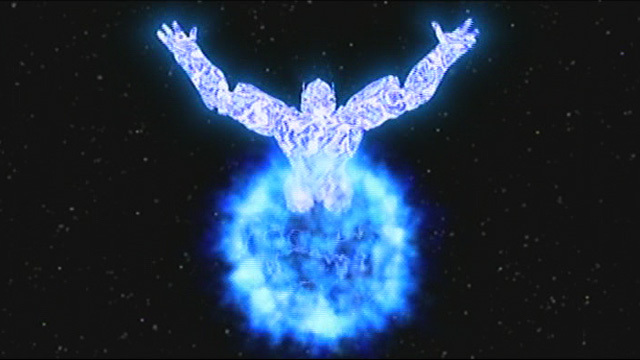 Optimus moves to bond Prime’s spark with his own, opening Prime’s chest and removing Prime’s spark from its container. Primal agonizes in pain, and then Optimal Optimus speaks to us some more. Rattrap looks confused. How can I say this? Well, for one, there’s so much speaking going on in this that you can barely hear the song itself. It’s not the same kind of speaking heard in narrations, the characters on screen are literally talking to the audience. Why is this bad? Because I’m trying to listen to the song and these guys just will not shut up! I do not care about their little gags and commentary that they want to share with us. I can watch the show itself to learn this very same information that they do not need to continue blabbering about! We don’t need to have a chit-chat with the characters when we can just watch the show to get what their talking about. We’re not stupid! Secondly, it’s just so darn loooooooong! All the other Japanese TF openings lasted only about a minute and a half each, even the movie ones. But this? !This thing ran longer than twice that length! It’s almost as if they were purposely trying to pad out the running time for this film. And the worst part is that this opening… *sigh* is honestly really nice. It summarizes all the events of the Beast Wars cartoon up to the mid-third season, introducing all the characters and keeping the audience informed about the plot. It’s because they put so much into this opening to make it look so good that it’s really hurtful to its status as an opening. If this were more like an AMV or something, it’d be so much better! But using something this long and this chatty (seriously, stop talking, guys!) is way overdoing it. It’s just feels like a desperate attempt to bill this one episode as a true feature film, when it’s really not that special. It’s definitely not as bad as former two (which in all honesty, aren’t quite that bad either) and has some potential. But, it falls very short with its excessive, unnecessary material. And that, my friends, completes all 23 of the Japanese Transformers openings. Till they make a new one, it is over -- Finished. As much as it pains me to say this, The Armada theme "song" was crap! Im glad the japanese at least got a real song! Sabrblade wrote: Though, in all honesty Wing Saber, if I hadn't put the two Micron Densetsu songs so high up, would you have commented here? This thread have been given a revamped overhaul! Thanks to the recent discovery that the YouTube tags are working now, each and every video in the countdown posts of this thread has had YouTube tags inserted and videos embedded. PLUS, and addendum has been made to the Entry #2, as there was one more version of that song that I missed. I'm going to preface this by saying, I haven't read every word in this thread, as that would just take too long, so I may have missed some things. I would also like to say, how you managed to do a top 20 and not just a top 10 is amazing to me, Sabr, as honestly, I think so many of these songs are deplorable. But for every god awful song Japan made, they made so many that were just awesome as well. Sabrblade wrote: 13. "GET MY FUTURE"
Sabrblade wrote: 7. "Tamashī no Evolution"
I love this song. You know Beast Wars was something special when it got songs from Mr. Dragon Ball Z himself! TriPredRavage wrote: I would also like to say, how you managed to do a top 20 and not just a top 10 is amazing to me, Sabr, as honestly, I think so many of these songs are deplorable. TriPredRavage wrote: How this is below the BWII Movie intro I... I just... I can't comprehend. Well, IMHO, I just find "SPACE DREAMER ~Haruka naru Beast Wars~" to be a bit more powerful and epic-sounding than "GET MY FUTURE". Don't get me wrong, they're both awesome, it's just that I get more excited when listening to "SPACE DREAMER" than I do when listening to "GET MY FUTURE". I actually have MP3s of every song from Transformers: Song Universe (though, I haven't found time to listen to all the songs yet ). TriPredRavage wrote: I love this song. You know Beast Wars was something special when it got songs from Mr. Dragon Ball Z himself! Oh, yeah! Though, he's done a good deal of TF songs in addition to this one. Well, it's the song that matters, not the show it belongs to. And it was a really difficult choice in the placement of the two Micron Densetsu songs and "EVO." The latter is the definitive embodiment of all things epic, while the former (especially "TRANSFORMER ~Dream Again~") is the definitive embodiment of all things epic specifically related to the Transformers. And "TRANSFORMER ~Dream Again~" just sounds so much like the iconic Transformers theme song in J-Rock form. Listening to it by itself, it doesn't even give off any vibes that tie it with Armada at all. It's like they just decided to make this fantastic Transformers theme and then slapped it on whatever cartoon they could at the time. And, it's Psychic Lover! That by itself is awesome (then again, so are JAM Project, Hironobu Kagayama, Kōji Wada, Masaaki Endō, and others). Sabrblade wrote: I actually have MP3s of every song from Transformers: Song Universe (though, I haven't found time to listen to all the songs yet ). That's where the kareoke track is from. Sabrblade wrote: Well, it's the song that matters, not the show it belongs to. And it was a really difficult choice in the placement of the two Micron Densetsu songs and "EVO." The latter is the definitive embodiment of all things epic, while the former (especially "TRANSFORMER ~Dream Again~") is the definitive embodiment of all things epic specifically related to the Transformers. Oh, I know it's the song that matters. I think Evo is the greatest TF song ever, in either language, regardless of the series it's attached to (which, does just so happen to be the second best TF series to date ). But what I mean is that, to Dream Again's credit, it does well to lure you into watching Armada. It's just that, when I hear "Transformers EVO. ", I think "Epic! Simply, EPIC!" But hearing "TRANSFORMER ~Dream Again~" I think "Epic! Transformers EPIC!" The latter is simply more Transformers-centric than the former, and this is the Top 20 greatest Japanese Transformers opening themes.